Bill Clinton vs. Chris Wallace on Fox News Sunday might be replayed and chewed on more than Matt Lauer vs. Tom Cruise. After all, the former leader of the free world was throwing punches this time, not just some strange-acting film star prone to jumping on couches. In case you haven't caught it yet, go here. Clinton, talking to Fox News Sunday for the first time ever, had an interest in promoting his three-day Global Initiative in New York. So some compromises had to be made in order to get the interview at all. "The ground rules were simple," Wallace told viewers before the fireworks began. "Fifteen minutes split evenly between the Global Initiative and anything else we wanted to ask." Wallace indeed began with a pair of marshmallows, which Clinton congenially answered. Then he threw something of a right-cross, telling the ex-president that many emailers wanted this question answered: "Why didn't you do more to put bin Laden and Al Qaeda out of business when you were president?" "I'm being asked this on the Fox network," Clinton began before also chiding "their little Pathway to 9/11" miniseries on ABC, which provoked a storm of controversy earlier this month. Leaning in and gesticulating, he lengthily berated "right-wingers" for wanting it both ways on bin Laden. Those who "now say I didn't do enough said I did too much --- same people," Clinton said. Eventually, and abruptly, he shifted his focus to a surprised Wallace. "So you did Fox's bidding on this show. You did your nice little conservative hit job on me." Furthermore, "You set this meeting up because you're going to get a lot of criticism from your viewers because (News Corp. chairman) Rupert Murdoch's supporting my work on climate change. You said you'd spend half the time talking about what we did out there to raise $7- billion plus in three days from 215 different commitments. And you don't care." Wallace protested and then said rather jovially, "I didn't think this was going to set you off on such a tear." But Clinton was rolling now, rebuffing Wallace's repeated efforts to revisit the Global Initiative topic. He urged his interviewer to read White House counter-terrorism expert Richard Clarke's book about the war on terrorism. "And you've got that little smirk on your face, and you think you're so clever." Sheesh. Fox News Channel regularly demonstrates a conservative tilt, but Chris Wallace isn't the guy to insult and browbeat about it. The former ABC newsman is the fairest in the land at Fox. Clinton, on the other hand, came off as churlish, childish and boorish as the interview progressed. Then he finally simmered down, and the closing several minutes became relatively collegial. Of course, most people already have taken sides. You're either for Fox News Channel or against it, for Bill Clinton or against him. But any objective martian would agree that Clinton over-did it on Sunday. He could have made his points concisely and forcefully. Instead he kept firing away, eventually shooting blanks. Lionized in death, vilified in life? 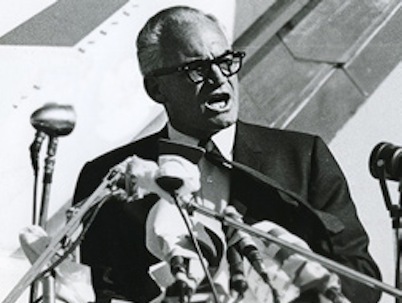 Barry Goldwater, branded a mad bomber in the 1964 presidential campaign, is seen in retrospect as a politician who actually had the courage of his convictions. Imagine taking positions without first filtering them through focus groups. That's right, kids. Back in the day, some public servants actually used to operate that way. HBO's 90-minute Mr. Conservative: Goldwater on Goldwater (Monday night, Sept. 18, at 8 central, 9 eastern) views the strong-willed Arizona senator through the at times dewy eyes of his granddaughter, CC. She was five years old when he ran for president and lost in a historic landslide to President Lyndon Johnson. CC is all grown up now. As evidence, she opts to wear an attention-getting low-cut top that doesn't suit this mostly serious-minded documentary. Not that it's a federal offense or anything. CC otherwise has gathered a very impressive array of interview subjects, most notably Hillary Rodham Clinton, Sen. Edward Kennedy and former U.S. Supreme Court justice Sandra Day O'Connor, an early acolyte. Mrs. Clinton, a "Goldwater girl" in the 1964 campaign, says she "admired his outspokenness, his wonderful sort of Western ways and values." Sen. Kennedy is an admirer, too, not of the late Goldwater's politics but of his straight-shooting style and substance. "He could differ, but he was never personal, never vindictive." Goldwater's book, The Conscience of a Conservative, sold an astounding 3.5 million copies. But his presidential campaign slogan, "In your heart, you know he's right," became ripe for ridicule and derision. The Rev. Martin Luther King, Jr. wasn't a fan. Goldwater's position against racial segregation but for states' rights made him a perceived arch enemy of the Deep South civil rights movement. "His election would be a tragedy and suicidal almost for the nation and the world," Dr. King said at the time. The senator had other interests. He was an avid ham radio operator and an accomplished photographer whose pictures of Arizona's Navajo Indians remain stunningly vivid. Goldwater's relationships with his children could be problematic. Like many fathers of that era, he wasn't a big hugger or overall love-dispenser. Nor was he around that much. "He was probably a better statesman than a father," says Barry Goldwater Jr., the spitting image of his old man. "But when you come to think of it, he was a good father." Barry Jr., a less successful politician than his famous dad, speaks poignantly and emotionally of aiming to please and invariably falling short. "We probably set too high a standard for ourselves," he says, his voice breaking. "We knew he loved us, but he had a hard time showing it and that probably hurt." In later years, Goldwater supported gay rights and also was pro-choice. Both issues hit close to home. His grandson, Ty, is openly gay and his daughter, Joanne, had an abortion as a young woman. Goldwater also loathed the religious right's advances into politics and was instrumental in persuading President Nixon to resign in the waning days of Watergate. "He enjoyed every minute of this thing, because he didn't like Nixon," says former Washington Post editor Ben Bradlee. "He wasn't sabotaging Nixon, but he wasn't doing anything to cushion his fall." Goldwater died in 1998. His ashes, along with wife, Peggy's, were sprinkled in his beloved Colorado River. It's appropriate then that longtime Democratic strategist James Carville sees him as "clearly John the Baptist to (Ronald) Reagan," who won the presidency in 1980 as a conservative Republican cast in the Goldwater mold. "Some of us think Goldwater won (in '64)," says conservative commentator George Will. "It just took 16 years to count the votes."